I would like to know how you prepared for the CCS exam. Did you study on your own? Or did you take a class? I took the self study class offered by AAPC. It took me about 5 months since I continued to work full time. I pass the test on the first try. I had a friend take classes at Penn Foster and she did not pass on the first try. 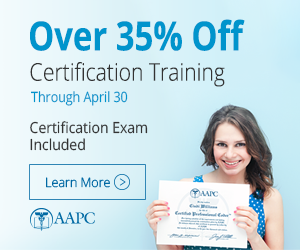 I liked the AAPC class because it was formatted very similar to the certification test. There were no surprised when I walked in. Thanks! I think she was asking about the CCS exam which is through AHIMA not AAPC. I took a class online through AHIMA for the CCA and passed on the first try - even scored 100% on a couple of the domains and in the 90's on another. I found the test much easier than the CPC. The CPC has a lot of coding on it, the CCA has "other" types of questions on it as well plus it is done on a computer - 100 questions, 2 hours and you get your grade. I didn't have to open any code books for the first 60 questions LOL. The CCA/CCS is mostly for hospital billing. The CPC is mostly for physician billing. The AHIMA class was good for the CCA, but didn't cover enough of the things that I needed to know for the CPC. I didn't pass the CPC the first time around and I'm waiting on the score for the re-take that I just took on Monday. I can't afford to take another class for the CPC right now, so I will just let it go if I don't pass this time. At least I have my CCA.